A dramatic exposé published in a 1994 issue of GQ magazine lamented that Yale was about to cheer its “Last Boola Boola.” The pre-apocalyptic article described an institution whose sluggish endowment struggled amid a “war zone of poverty, crime, and drugs as frightening as any American city.” New Haven was hauling itself out of a recession, and while the city and Yale were certainly not quite as rotten as the article made it seem, the bad press was an indicator of the University’s declining public image. It was true that bad blood between Yale and New Haven had existed for decades. “Twenty-five to forty-five years ago, there was a time when the president of Yale and the mayor of New Haven wouldn’t even speak to each other,” remembers Sam Chauncey ’57 who served as the University’s vice president and secretary under President Richard Levin GRD ’74. The 1991 murder of Christian Prince, a fourth-generation Yale student who was shot through the heart on Hillhouse Avenue, shocked the Yale community. His was the first murder of a Yale student on campus since 1974. Even as it highlighted the gulf between the campus and the rest of the city, Prince’s murder served as a reminder that Yale was inseparable from New Haven. The Yale Homebuyer Program was a product of this turbulent time, when the Elm City and its wealthiest institution shared a bleak outlook but seemingly little else. Less than a year after his inauguration, Levin announced the initiative: any Yale employee who bought a house in New Haven would receive two thousand dollars per year for ten years to help offset the city’s hefty property tax. Modeled after similar programs at Columbia and the University of Chicago, the program was designed to simultaneously stabilize the University’s workforce and address the city’s blight. “It asked, how can we promote efforts that create fierce neighborhood loyalty through homeownership?” remembers former mayor John DeStefano, who was sworn in four months after the program began. Today, the Yale Homebuyer Program has declining relevance for New Haven, but it remains a centerpiece of Yale’s sloganeering about its investment in the city. The Yale Homebuyer Program has declining relevance for New Haven, but it remains a centerpiece of Yale’s sloganeering about its investment in the city. According to The New York Times, in 1994, when the Homebuyer Program was founded, only about thirty percent of Yale’s employees lived in New Haven. Yale employees met the program with a mix of praise and trepidation. For some, the program was a welcome incentive to move into New Haven. For others, it wasn’t enough to make the city seem safe. Dee Dee Emery, a food service worker who rented an apartment in New Haven, and whose son had been shot and killed the year before, told the Associated Press in July of that year that she still wanted to move out of the city. “Anywhere away from here,” she said. But others jumped at the financial benefits. “If it weren’t for Yale’s assistance, we wouldn’t be looking [for a home] in New Haven,” Richard Gold, a professor at the School of Drama, told the Yale Daily News in October 1994. According to the 2010 census, New Haven had the largest population growth of any city in New England over the previous decade. New Haven’s crime rates hit a twenty-year low the same year, and today New Haven has one of the lowest vacancy rates in the country, according to the Hartford Courant. Luxury apartment buildings are popping up in response to the high demand for housing. But at the same time, says Jim Paley, executive director of Neighborhood Housing Services, “We have a great disparity between more affluent people in New Haven and poor people.” Homes in wealthy neighborhoods, continues Paley, have had fairly stable value on the housing market. Those in lower income neighborhoods, though, have seen a precipitous fall when the economy declines. 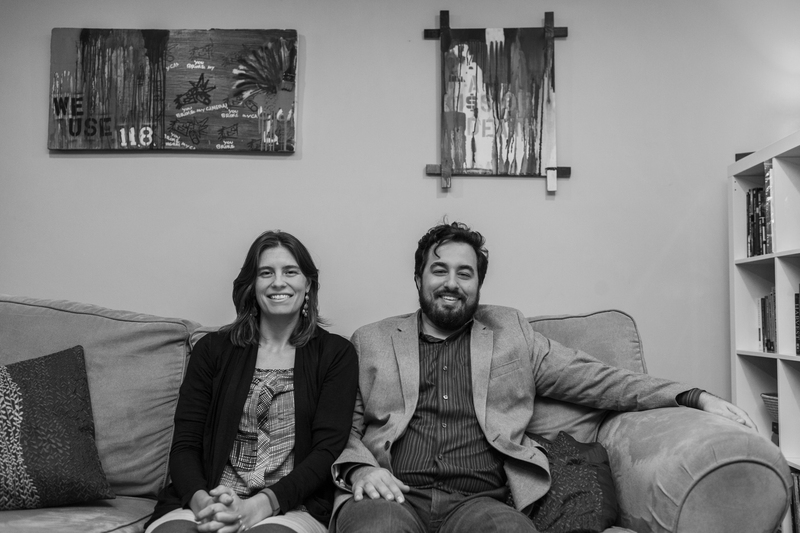 Joshua Galperin and his wife, Sara Kuebbing, in their home. Photo by Jennifer Lu. The question to consider, then, is what role the Homebuyer Program plays in a city that is very different from the city of twenty years ago. Since 1994, Yale has committed more than $28 million to the Homebuyer Program. The program has produced over a thousand happy poster children who, as Chauncey points out, can go on to be “ambassadors for Yale” in their neighborhoods. And with these many beneficiaries and the good press that has followed each biennial renewal, the Homebuyer Program is an opportunity for Yale to profess a commitment to New Haven. It’s clear that the program serves Yale. It’s less clear that it still serves New Haven. ***May Brantley stands at the front door of her home surveying the busy rain-slicked road on a November morning. The street is lined on one side with colorful houses whose azure and lime-green paint peels in small patches. On the other side of the street are several small apartment buildings with uniform windows that seem to repeat endlessly down the street. Brantley, a lifelong New Haven resident who works in Yale’s Theater Studies Department, purchased her home in the Dwight neighborhood two years ago. “All I could say was wow,” she remembers, recreating the open-mouthed look of delight she wore when she first walked into the house. From her vantage point on the couch, she points out all the things she loves about her home: a small stained-glass window, her collection of potted plants, a fireplace stocked with logs, stairs leading to a spacious bedroom. She has a room for her mother to stay in when she is visiting, and a backyard that is large enough for family barbecues. She had been planning to leave New Haven until she heard about the Homebuyer Program. “I was going to move to Hamden,” she says as the television plays softly in the background. “They have much lower taxes there.” The benefit provided by the Homebuyer Program, though, was enough to at least partly offset the high property taxes she has to pay. According to Michael Morand, Yale’s former director of New Haven Affairs and a current employee of Office of Public Affairs and Communication, the Homebuyer Program has two primary target audiences: people who live outside New Haven and might not have considered moving into the city, and people who rent in New Haven and need assistance or incentive to buy a home. Brantley, who fits into the second category, is a model beneficiary of the program: a native of the Elm City who could afford to purchase a home thanks to Yale, and as a result promotes stability in the Dwight neighborhood. When Brantley bought her home two years ago, the program had gone through around ten renewals and modifications. When it first began, employees could receive the benefit if they bought a home anywhere in New Haven. After the first two years, it was limited to only homes purchased in parts of East Rock, Beaver Hills, Wooster Square, Dixwell, Newhallville, Dwight, the Hill, and West Rock. Specific areas of the latter five neighborhoods are federally designated “empowerment zones” in need of economic development. Fair Haven, which does not include an empowerment zone, was also added to the Homebuyer Program in 2003 at the request of union contract negotiators to accommodate employees who wanted to live in a primarily Latino neighborhood. Now, eligible employees—professors with appointments of at least one year and permanent staff who work at least twenty hours per week—can receive up to a total of thirty thousand dollars, paid in installments over ten years. One way of reading Yale’s selection of neighborhoods, says Chloe Taft, a postdoctoral associate in the American Studies department who teaches a course on the history of housing in America, is to conclude that Yale has chosen the empowerment zones as areas that could particularly benefit from increased homeownership and the investment it would bring. “On the other hand,” she continues, “Yale has an interest in creating buffer zones” by investing specifically in the areas that border the campus, creating more stability through homeownership in an area, like Dixwell, that is close to student housing. Yale’s focus on empowerment zone neighborhoods also contributes to subtle shifts in the demographics of communities surrounding the University. “The Homebuyer Program is gentrification in that it implies investment in the community,” says Elihu Rubin, an assistant professor at the Yale School of Architecture. “The dark side of that, though, is displacement.” As homebuyers purchase homes and go on to live in them instead of renting them out, a house that might have once been rented out at an affordable rate is no longer on the market, reducing supply and, considered on a large scale, gradually raising prices. Though the Homebuyer Program has not caused the rents to skyrocket, it now sits in the uneasy position of handing out money without making a concentrated effort to direct it to places that truly need it the most. DeStefano points out that New Haven’s housing problem today—now that the rate of home vacancies has been brought down significantly—is the availability of affordable housing. “The community that is feeling squeezed by the development of market-rate housing feels like we need to have policy that preserves affordable housing,” he says. Bridgette Russell, director of the Homeownership Center of the Neighborhood Housing Services, points out that New Haven has become a target for real estate investors because of its low vacancy rates—2.1 percent, according to the New York-based real estate research firm Reis—and high rents. According to a 2014 report by the City of New Haven, the average monthly rate for a two-bedroom apartment in the city is high: $2,173. Though the Homebuyer Program has not caused the rents to skyrocket, it now sits in the uneasy position of handing out money without making a concentrated effort to direct it to places that truly need it the most. ***Despite the changes in the city and the University, Yale touts the program as proudly as ever. “For more than two decades, the University has sought to engage in even more powerful ways with its neighbors,” says Morand, delivering a well-practiced speech in his deep baritone. “The Homebuyer Program is a key facet of this comprehensive engagement with our neighbors.” The program has attracted roughly thirty-five participants per year in the last few years, and the majority of those homeowners end up staying in their homes for a long term. In that sense, Morand says, it is a clear success. And participants in the program are, unsurprisingly, thrilled by the financial rewards and by more intangible benefits. “I definitely feel more vested in New Haven as a city,” says Sarah Kuebbing, a postdoctoral associate in the School of Forestry. She and her husband, Josh Galperin, who teaches at Yale Law School and the School of Forestry, bought their home in Beaver Hills after renting an apartment in East Rock. Even though they were already living in New Haven, looking to buy a home encouraged them to move outside of the “Yale Bubble,” as they referred to it several times during our interview. “I’m more interested in the community and the politics than I would be if I lived in East Rock,” she says. Owning a home in Beaver Hills allows the couple to take advantage of one of the greatest benefits of living and working in New Haven—the short commute—while also being able to become part of a close-knit community. On weekends, they spend much of their time working in their yard, which slopes high above the street and gives them a good vantage point from which they can talk to their neighbors next door and across the street. “They’re great neighbors,” says Dana Holahan, who lives next door to Galperin and Kuebbing. “They’re committed to making the neighborhood better.” Homeowners like Galperin and Kuebbing are exactly the type of “ambassadors” that Chauncey says the University hopes to dispatch through the Homebuyer Program. But while the ambassadors help Yale put forward a friendly face, DeStefano says housing is no longer the biggest problem that New Haven faces, and certainly not as big a problem as it was in 1994, at least as far as vacancies and rampant blight go. “The problem now is how we invest in young people, not how we invest in housing stock. I frankly happen to think that investment in core competencies of human capital around things like higher education, entrepreneurship … are more important,” DeStefano says. The Homebuyer Program is essentially an investment, and as with any investment, it is made because the investor plans to get something out of it. ***After the end of her Thursday shift in the Berkeley dining hall, Annette Tracey leans forward in a chair in the common room and proudly flips through pictures of her home in Dixwell. “This is my back yard… This is my street…” she says, swiping quickly through sunny photos of her red-with-white-trim house on her phone. She leans back, her lipsticked mouth pulling back into a wide smile as she shakes her head, still in disbelief at her good fortune ten years after she bought her home. A happy-ending story like Tracey’s is certainly one of the biggest accomplishments of the Homebuyer Program. Indeed, in the twenty-two years and counting of its existence, the Homebuyer Program has helped more than a thousand Yale employees buy homes and fulfill their “American Dreams,” as Tracey puts it. But the Homebuyer Program is essentially an investment, and as with any investment it is made because the investor plans to get something out of it. Morand concludes that one of the many functions of the Homebuyer Program today is “maintaining the momentum that New Haven has built over the last twenty years.” But when it comes to maintaining the momentum of the city’s tremendous comeback since the nineties, it is hard to see how the Homebuyer Program, ill-suited to the city’s current needs in education and employment, could play a big role.